I love using this washer. The steams cycles are the best at getting those wrinkles out and refreshing your clothes and fabrics. I wish o could throw a couch in there. Perfect for bedding and everyday use, as well. No complaints besides some of the cycles being kind of long. Great machine. Durable. Cleans well. Delicate inner ring. I have 4 kids from age 19 to 1. I use it everyday and it works great even for dirty cloth diapers. Good at getting out most stains. Does get smelly and the ring on the door will leak if it is accidentally punctured so be sure to check your pokets. With heavy use over the last 5 years it has been reliable. We wash an average 3-4 loads a day and heavy bedding and towels weekly. Spins clothes dry which reduces dry times significantly. We replaced the ring on the door ourselves and it was fairly easy if you are handy but definitely not a uick thing to do. Operation of the machine has been consistent and dependable. Great washer. It will clean anything. This washer does a great job on everything you can think of. I love this washer!! It gets all my clothes clean with the least amount of water. 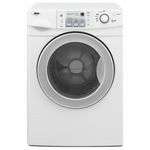 It also removes all the water which in turn reduces the time in the dryer, the only downside is the cycle time is longer. I absolutely love my new Samsung Steam front loader. I didn't realize how small but old Matching was until i brought this home. It's much bigger and i love how the drum is somewhat on an angle. 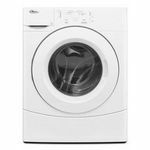 It's very simple to use and has a setting for just about anything you need including delicates, bedding, heavy duty, quick wash, and more. I can see the difference in my clothes and how much cleaner they are. They colors come out bright and colorful and the whites come out as white as can be. I am so happy with this. The steam setting is awesome and i love having that option. It makes it easier when you can get to a dry cleaner. The tray on top is easy to pull out and lush in and has a separate section for detergent, bleach. fabric softener, and a removable tray for powdered detergent. Overall this machine has given me no problems and i love the versatility of it. 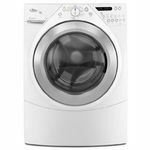 It's super quiet and there's no moving when it spins and you can really tailor every wash. It also has a memory setting and it remembers your last setting. I definetly recommend this machine. I got this washer/dryer last year for Christmas at a Black Friday sale. I love it. My husband's work clothes with old stains that I had done everything to get out, came clean on the first washing. It is quiet, efficient, and does an amazing job. I love the sanitize cycle, just to keep our home clean in a dirty world. 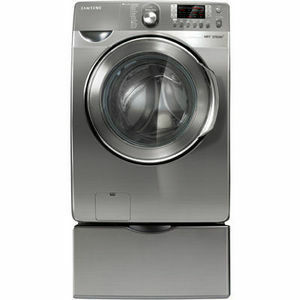 I would recommend this set to anyone who is looking for a great washer at a great price. Well worth every penny!! Energy Efficiency Uses almost no water, and is very electric efficient Cleaning Time takes longer than a normal washer, but it is sooo worth it for really clean clothes Performance Clothes are clean, all stains come out first washing, even the old ones that I could not get out in the past. I have never seen old set in stains come out completely before. I am amazed. My clothes are not wadded up and wrinkled coming out of the washer, even ok for my delicate undergarments. No more having to un-tie things before putting in the dryer. Ease of Use Really user friendly, if you can read, you can use this machine Design I think it is beautiful. Durability I have only had it one year, so I cannot speak of long term durability, but it is still just like new after 11 months. 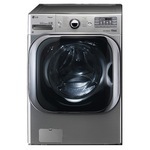 The Samsung Front Load Steam Washer W is another great product from Samsung. I got this almost a year ago and have enjoyed using it. Its energy efficiency is perfect for my household washing. The cleaning time can be adjusted to suit my need which depends on the kind of clothing material that I want to wash. It is very easy to use as the buttons and the knob are clearly labelled. The design is perfect with stainless steel body and a glass door. The performance is okay although some stains might not come off until I hand wash it afterwards. It is durable as I have had no problem with it whatsoever. My only concern though is the fact that when the clothes are spinning, the washer makes such a loud, continues noise until the spinning stops and the clothes are transferred to the dryer. I will recommend this product especially for large families to minimise the high cost spent on laundries. Much better product than first years out! Don't let mould comments scare you off on this model as it has a tub clean cycle that I run once a month and never had bad smelling or mold develop in my wash drum. Huge capacity, great dispensers for soap etc, low water usage, clean clothes that are almost dry when I pull them out. Very quiet and trouble free machine and would purchase again. Performance Cleans large loads as well as small ones. Does a great job on heavy cottons to finest delicates. Love that my king bed comforter fits well in large drum. Ease of Use One of my favorite features is the pre marked dispensers for detergent etc. I was always putting in too much softener and this helped substantially in my cutting back to correct amounts and saving money. Design Looks great and even though I didn't purchase the matching pedestal drawers, my husband built a single pedestal to raise them so I wasn't bending over so far. My back thanks him daily for that! They are an esthetically pleading no matter how you gave them set up. I was highly impressed with this washer. 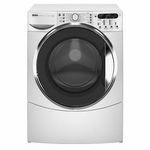 I have owned many top-load washers before I bought this front load washer, and this was also my first Samsung appliance purchase outside of their televisions. With this washer there are so many options to choose from for wash cycles, it actually amazed me. I have only two complaints and those are better ease of cleaning, and better color options. This washer is not the easiest thing to clean, its complicated and they really made it a challenge. If you are unsure how to properly clean it, Google it or something so you do not mess up the machine. Back to my other gripe of color variety. My appliances are all black, and I am picky, which means I like all my appliances to match. I had to settle with stainless, which is nice, but I would have preferred more of a variety. Aside from the two complaints this is a great washer, and you will not be disappointed if you purchase it.